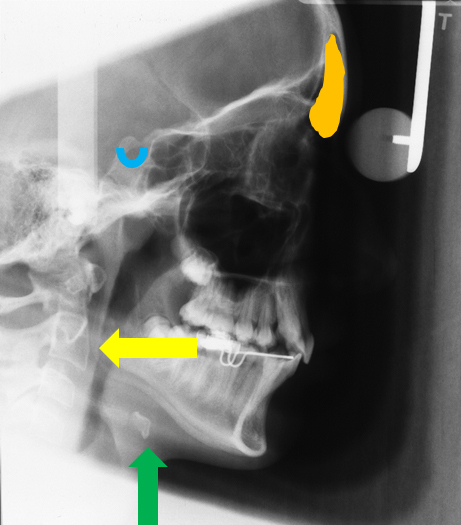 The right and left sides of the inferior border of the mandible (yellow arrows) are seen superimposed over each other. The right and left maxillary sinuses (green dots) appear as a radiolucent area superior to the apices of the maxillary teeth. The floor of the nasal cavity (blue line) appears as a horizontal radiopaque line at the apices of the maxillary teeth. The hyoid (green arrow) appears a radiopaque entity inferior to the mandible near the angle. The cervical spine (yellow arrow) is visible at the lateral aspect of the image posterior to the mandible. The sella turcica (blue U) appears as a radiopaque U superior to the condyle and posterior to the sphenoid sinuses. The frontal sinuses (orange area) appear as a radiolucent area at the anterior portion of the skull just superior to the orbits. I hope you find this post on lateral cephalometric skull anatomy informative. While I didn’t cover all the anatomy visible, these are the more commonly seen entities. If you have any questions, please let me know. i would like to sea post about lateral cephalogram correlated with radiographic anatomy in orthodontics . Thanks for the topic suggestion and I will work on posting a blog on that topic in the next couple of months.